Are you a seafood lover? If you answered with an emphatic, “Absolutely!” join us in celebrating the 6th annual Boston Seafood Festival on the Boston Fish Pier on Sunday, August 13, 2017, from 11:00 AM to 7:00 PM. You will get a crash course on all things New England seafood. 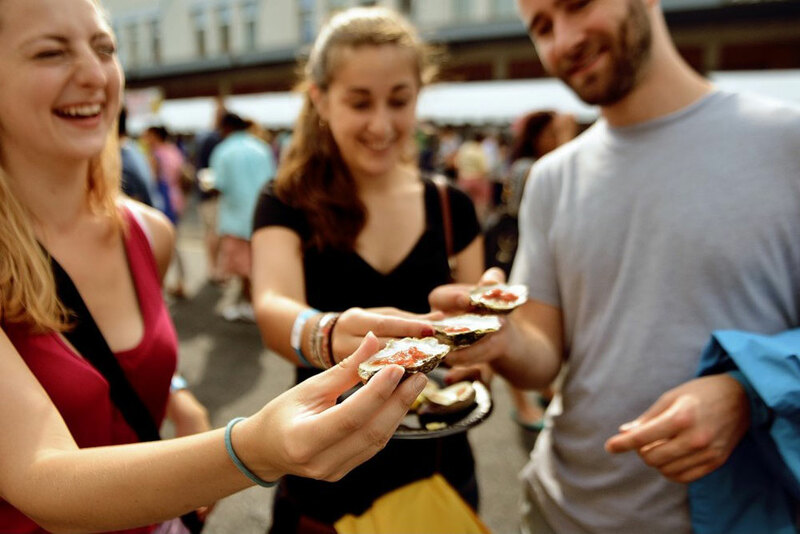 This all day event is fashioned after the traditional New England lobster bake and features tastings of fresh caught local seafood, live entertainment, educational events, and demos from some of Boston’s finest chefs. Enjoy fresh steamed lobster, steamed clams, locally grown corn on the cob, pasta salad, and warm soft buns at the all-day Lobster Bake tent. Fancy yourself an oyster shucker? Put your skills to the test. Register to participate in the shucking contest for a chance to win cash prizes. Or kick back and enjoy the contest as a spectator. Catch public demonstrations from dozens of chefs from Boston’s most popular restaurants. You will learn new ways of preparing fish, as these experts share their secrets. There’s a whole lot more food being offered than what’s in the Lobster Bake tent. Dozens of local vendors and food trucks will be offering fresh caught seafood, sides, and plenty of non-seafood items too. You’ll have worked up quite a thirst from all the food and activities. Boston’s Harpoon Brewery will have a 21+ area set up serving pints of Harpoon IPA, Harpoon Craft Cider, UFO White Ale, and UFO Huckleberry. The beer garden will feature lawn games, including corn hole and giant Jenga. Don’t hesitate to bring the kiddos with youl this event is family friendly. There will be plenty of kids’ activities to keep the little ones entertained. The Boston Seafood Festival is managed by the Boston Fisheries Foundation, an organization founded in 2012 with the goal of educating and promoting the health of Boston’s fisheries. Festival co-founder Joe Zanti, owner of Yankee Lobster Co., explains, "We want to offer a fun day to enjoy one of New England’s most important natural resources in a responsible and enjoyable way. We’ll be celebrating our maritime heritage together, and eating some really good food!"